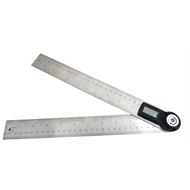 The Craftright 300mm Digital Angle Finder performs the functions of both a ruler and angle finder. It is a great portable and lightweight tool to use for a wide range of applications including DIY projects, woodworking, construction and machining. Ideal for the home handyman, it gives an accurate digital reading of angles and lengths simultaneously and features a locking function to allow measurements to be locked at any desired angle for precise measuring and marking.